Governmental laws heavily regulate the food processing industry and set in place health and safety requirements that every company must abide by. Non-compliance to any of the laws and regulations enforced by the USDA and FDA can result in the halt of production, leading to huge losses of both product and revenue. Compliance is an integral part of the food processing industry. Hoffmeyer is proud to offer a complete line of FDA, USDA, and EPA compliant belts that have been specifically engineered to meet the industry’s needs and keep your production moving. We supply compliant food grade conveyor belting for baking, meat processing, and general food handling. Hoffmeyer carries belting that is grease and oil resistant, non-stick, and cut-and-gouge resistant for baking and dough handling. In the meat-processing industry, anti-microbial food processing belts are necessary to comply with regulations. For poultry, beef, seafood, and pork processing, we provide belts with an additive that inhibits bacterial growth. We also provide belts for frozen foods and specialty food processing applications—just ask! Hoffmeyer Food Flex™ and Little Giant food processing belts are available in nitrile, SBR, and polyurethane. All of Hoffmeyer food processing belts meet and exceed FDA, USDA, and EPA regulations. In addition to Food Flex™ and Little Giant food processing belts, we carry a wide variety of thermoplastic belts to meet the additional demands of the food industry. Hoffmeyer carries food-grade extruded urethane belting (flat and round), plastic modular belts, polyurethane belts, TPU food conveyor belting, and more. We don't just supply you with the right belt; we ensure it has the fabrication you require, such as sealed edges, cleats, sidewalls, v-guides, and other necessary features. At Hoffmeyer, we are dedicated to friendly and knowledgeable customer service. Our staff is extremely knowledgeable about the food processing industry, and has more than 90 years of experience in determining the correct belting for specific conveying applications and conveyor systems. Contact a Hoffmeyer rep today; we will discuss your needs and help you find the exact food-grade, FDA/USDA compliant, conveyor belting your business needs to grow and succeed. Hoffmeyer is an industry leader and is dedicated to surpassing your expectations. 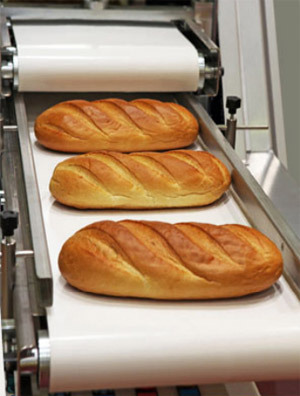 We provide a full line of food conveyor belts and belting to meet your company’s food processing belt needs.